KiSSFLOW tables are very functional and easy to navigate. You can treat tables in KiSSFLOW forms just like you would treat a spreadsheet, except that you have multiple field options. In this example, I have a date field, a currency field, a user field, a yes/no field, and a dropdown field. You can enter the information directly from the form, or you can copy it from a spreadsheet. When copying data for a date field, make sure the date/month format matches what you set up in your locale settings on the Admin tab. User field data should be in email format. Yes/No fields can display yes/no, 1/0, or true/false. For dropdowns, checkboxes, and master fields, your data must match with one of the options present. Simply copy and paste the data into a table. You don’t need to add more rows, the table will automatically expand to accommodate however many rows you paste. If any of your data doesn’t validate, the cell will be empty. In this case, I entered the email of a user who doesn’t exist in the system. So, I’ll have to manually change that. 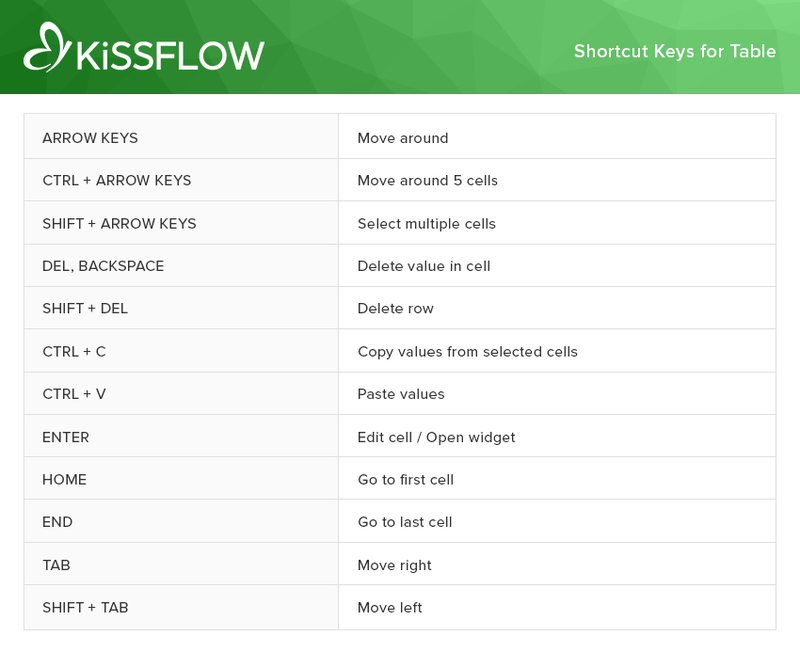 App Admins can change the width of a column in a KiSSFLOW table in the App builder.